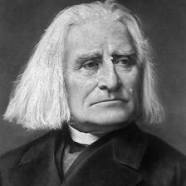 Franz Liszt was a legend, even in his own time. According to the written reports of the critics and concert-goers who heard his performance at the piano, he combined his genius as a virtuoso with a style of showmanship not too far removed from that of the present-day rock artists. Liszt apparently borrowed some of his mannerisms from the Italian violinist Niccolo Paganini, who was rumored to be in league with the devil. When Liszt titled some of his works Faust Symphony, Dante Sonata, and Mephisto Waltz, he only confirmed the suspicion by some that he also had demonic powers. By 1847, which he was still at the height of his performing ability, Liszt had made the decision to give up paid concerts (he still played command performances for the pope in Rome and an occasional charity concert in Budapest), and concentrate on composing. In 1848 he moved to the tiny German province of Weimar, where he had a court orchestra and a court opera at his disposal, and he gained a thorough knowledge of orchestration as he experimented and composed. Liszt’s inspiration for Les Preludes came from the poetry of Alphonse Lamartine (1790-1869), an aristocratic French author and diplomat. When Liszt read the lines, “What is life? Only a series of preludes to that unknown song whose first solemn note is tolled by death,” he had the title for his most famous symphonic poem. Liszt’s composition approximates the succession of images in Lamartine’s poem -- the mysterious opening, the crescendo to the first transformation of the theme, the tranquil version of the opening phrase, another crescendo to “the tragic storm that cuts short the illusions of youth,” a calm interlude, and the final triumphal sounds that signal that “the soul has proved itself in battle” -- the music sums up the temper of the mid-19th century in a manner no historian can equal. Liszt, F.; Brown T. (1936). Les Préludes. Symphonic Poem. [score] Boosey & Hawks: London. Smith, Norman E. (2002). Program Notes for Band. Chicago: GIA Publications. pp. 382. This page was last edited on 12 October 2016, at 17:29.